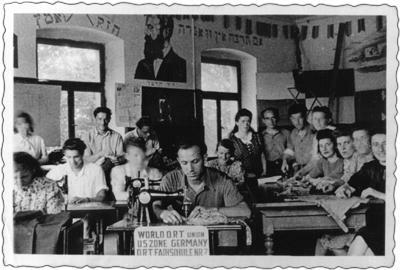 Holocaust Survivors: Photo Gallery - "Sewing Class"
Joseph Sher was employed by ORT to teach other survivors the trade of sewing. Rachel Sher is sitting in the second row in the center of the photograph. On the wall is a drawing of Theodor Herzl, the father of the modern State of Israel.